When you live in a smaller property, you most likely find that there are both advantages and disadvantages. On the plus side, with a smaller home you will probably pay less, including perhaps rental costs and utilities bills; on the minus side, however, there is less space to store your belongings and to entertain friends and family. However, if you feel that you are “stuck” in a small space and that your surroundings are necessarily cramped and ugly, think again. There are lots of ways to make your small space elegant and chic, and they won’t cost a fortune. Simply use your imagination, and follow these few wise tips. If you paint your walls in darker colors, they will shrink your room, whereas paler colors will open it up and make it look lighter and brighter. 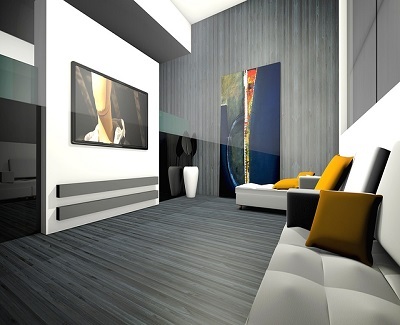 If your living room is really small, for instance, opt for white or magnolia. Treat the walls and ceiling as your background so that you can use alternative colors to dress it up. The same is true of flooring, as a dark floor will make your space look smaller, while a paler one will make it seem larger, as if by magic. Pale-gray French oak floorboards look fabulous, or simply paint existing darker boards in a lighter color, making sure that you have permission if you don’t happen to be the homeowner. Even a large room that is cluttered and untidy will look smaller, so aim to be scrupulous about clearing away things that you don’t need to have lying around in your living room. Opt for a minimalist style, on the basis that less is more – less clutter means more space. Get rid of bric-a-brac and unwanted ornaments, or, if there are things that you want to keep and to display, opt for a storage unit that suits your room. 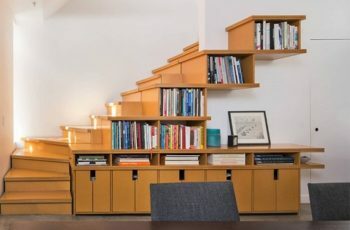 For example, if floor space allows, use a freestanding cabinet made of glass, on the basis that being able to see the wall on the other side makes your room seem bigger, or use a compact unit that fits neatly into a corner with a surface that can serve as a base for a lamp. If that doesn’t suit, consider wall-mounted options, but avoid deep cabinets unless you can also mount them in a corner. 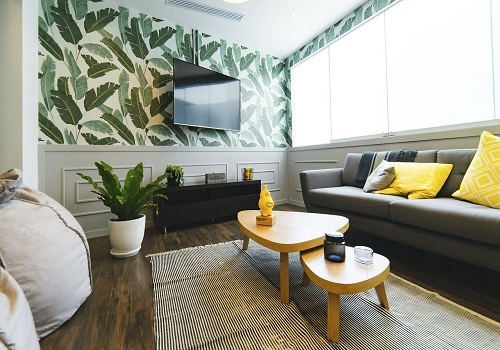 Small living rooms can benefit from over-door storage, as even if your ceiling happens to be very low, a simple shelf can hold attractive storage boxes or baskets. Make the most of your windows by using shutters as a finishing touch, rather than hanging bulky curtains. Window shutters are elegant and will add a streamlined effect to your minimalist décor. You can choose a color to match your walls, or opt for a contrasting accent shade to bring together the other elements in your room, such as scatter cushions, artwork, or a small area rug. Avoid filling your living room with large, heavy, dark-colored pieces of furniture, despite the fact that they might be cheap in a yard sale, as they will pretty soon overcrowd your limited space. Instead, choose pieces that are light colored and multifunctional where possible, as well as comfortable, of course. It can help to place the largest item, say a small couch, furthest away from the door so that when you enter the living room, you don’t have to navigate around it. Positioning items around the perimeter of the room will help make it look larger, and small side tables next to your couch or chairs can be better than a central coffee table. If you prefer a central unit, however, at least go for one that has built-in storage to help you keep the room tidy. Apart from any wall-mounted storage that you may have chosen and any artworks that you like to display, don’t forget to make the most of mirrors. They not only reflect light from your windows but also enhance the impression of spaciousness. Use them strategically so that you get the best possible results, remembering that bigger sizes will mean that you will increase the impression of a larger space. You can place a mirror behind a console or a cabinet in such a way as to draw the eye towards it, thus reflecting more light and any objects in view. A mirror placed between two windows will help to increase the natural daylight as well as give the appearance of more space.